While streaming is a simple concept on paper, the reality of it is anything but. Not only do you have various services to juggle and choose between, but you also have the question of which device(s) you’ll be using to access all that digital content. Sure, you could spring for a smart TV, but some have limited app support and their built-in interfaces are often lacking. Similar shortcomings hold back cable boxes and game consoles from being the top pick as well. That’s why the best option is an external streaming device. Not only do streaming devices feature the widest app support (and therefore largest possible content libraries), they’re also incredibly easy to use, have a small physical footprint, and can easily slot into even the most compact of home theater setups. The only question is which one is best for you? Below, we list our recommendations for the absolute best streaming devices out there so you can get the most from your streaming experience. The Amazon Fire TV Cube won our award as one of the best products of the year. Make sure and check out all our other selections for Best Products of 2018. Why should you buy this? The Cube isn’t just an excellent streaming device — it can control your entire entertainment system better than your remotes can. Who’s it for? Those looking for a streamlined, Alexa-driven home entertainment experience. It was going to take a lot to knock a Roku device out of our top spot, but the Fire TV Cube has snatched the crown of the streaming device kingdom. That might be a surprise, especially since the device was originally announced as little more than the first Fire TV box to have Alexa integrated directly into the device — no external Echo speaker necessary. In reality, however, it’s loaded with powerful tech and features that will allow you to control just about everything in your entertainment center with minimal need for a remote. Thanks to HDMI CEC- and HDMI ARC-capable ports alongside included IR blasters, you’ll be able to use voice commands to turn on your TV, swap between apps, and even switch inputs over to other connected devices like gaming consoles, A/V receivers, and Blu-ray players. You can walk into the room with the TV and all other devices off, and direct Alexa to do things like “play Stranger Things,” and the Cube will switch on the TV and sound system, and immediately start up the show on Netflix — all without a remote. Using the Cube like this is pretty much the closest we’ve felt to talking to the computer on the Starship Enterprise. While Alexa will require specific voice commands out of the box, the A.I. assistant will learn to recognize your input style. Amazon has also promised to continually update Alexa’s recognition abilities and tune the assistant to meet the needs of users, meaning simple, even vague speech may be recognized as more people use it. The Cube’s nature as a home theater control hub may be its biggest selling point, but it is also just an excellent streamer. The black box is capable of 4K and HDR playback and comes with an Ethernet adapter for the most reliable data connection possible — something sorely lacking from other Fire TV devices. Speaking of upgrades, the Fire TV Cube features a much more open and platform-agnostic interface than what we’ve seen from other Fire TV releases. In the past, using a Fire TV meant you were funneled to content on Amazon’s platform, with other apps and services buried or excluded. Thankfully, that’s much less of an issue here. The singular fault we can find with the Fire TV Cube is its current lack of Dolby Vision support. Other than that, it’s better than we ever imagined it could be. The onboard Alexa integration, Ethernet adapter, and more open ecosystem solve our biggest issues with previous Fire TV devices, but it’s the all-in-one control afforded by HDMI CEC support, IR blaster, and Alexa voice commands that earned it the throne. Why should you buy this? It’s the best streaming stick on the market, and it’s affordable to boot. Who’s it for? Anyone who wants to stream 4K and HDR through an easy-breezy interface. The Streaming Stick+ delivers one of the best features-to-price ratios among streaming devices out there. You’ll be able to experience 4K HDR video and Dolby Atmos Audio through this tiny device that looks like a USB thumb drive and easily hides behind your TV. The discreet design extends beyond just its physical profile. Thanks to powerful 802.11ac MIMO dual-band wireless support, you’ll be able to set it up anywhere within your home’s Wi-Fi range — no Ethernet required. The only actual requirement with the Streaming Stick Plus is a TV or any display with an HDMI port and USB. Just plug the Streaming Stick Plus into the HDMI port and the power cable into one of its USB ports (or an adapter if it doesn’t have one), and you’re done. One of our favorite things about the Streaming Stick Plus is a feature shared by all Roku devices: An awesome user interface. Roku OS uses an app-agnostic approach, which makes finding the best place to watch what you want easier than with almost any other device on the market. Even with newer devices like the Amazon Fire TV Stick 4K available, we still prefer the Roku’s voice search and easy-t0-use interface. As far as we’re concerned, it’s still the best streaming stick on the market. Why should you buy this? It’s a powerful, well-rounded set-top streaming box bolstered by Roku’s excellent interface and app support. Who’s it for? Those who want the features of the Streaming Stick+, but desire a little more horsepower and stability. The Roku Ultra brings with it a slew of awesome features. Like any high-end streamer, it supports 4K and HDR (though Dolby Vision isn’t currently compatible), but that’s just the beginning. Like the Cube, the Ultra sports an Ethernet port to help improve connection speeds and even adds a MicroSD card slot to store even more apps or work as a source for pictures and video. It also has a USB port, so you can view content from any compatible device. The box also features a “lost remote” button that will trigger a tone from the remote (even though we all know it’s under the couch). The remote has both a headphone jack for private listening and dedicated power/volume buttons that can control TV volume, depending upon the model. Night Listening mode automatically adjusts volume scene-by-scene to avoid waking up the kids, and the included JBL headphones should offer better sound for headphone playback as well. As you probably already surmised from the Streaming Stick+ copy above, we also just love the Roku OS. From the biggest library of apps (aka “Roku channels”) to incredible cross-channel search functionality, there is no digital ecosystem that competes. Why should you buy this? It offers 4K and HDR paired with premium gaming features. Who’s it for? Those who prefer their streaming with a healthy side of gaming. Most of the products on this list are squarely focused on streaming video, but despite the “TV” in its name, the Nvidia Shield TV takes a different approach. The device features 4K resolution and HDR streaming capabilities based on the Android TV platform, but at its heart, the Shield TV is designed with gamers in mind. More than 200 games are available to play via Android TV, with many exclusive to the Shield TV. If you’re a PC gamer, the ability to stream PC games to your Shield TV while you kick back on the couch makes it an even more attractive option. The base version, which sells for $200, includes just 16GB of storage, but $300 gets you 500GB, along with MicroSD and Micro USB slots. The included controller — which Nvidia has revamped — provides a familiar feel to experienced console gamers, and the device also supports most other Bluetooth controllers out there, including Sony’s DualShock 4 and Xbox One controllers. For those who want the muscle of the Shield’s hardware but don’t want (or need) the wireless controller, a remote-only 16GB option is also available for $180. For 4K streaming, Netflix, Vudu, UltraFlix, Amazon Video, and YouTube are all supported, with HDR support available on select services. For HD streaming, many more options are available, including HBO Now, Twitch, CBS, Fox, and Vimeo — basically, anything in the Google Play store — and live TV is available via Sling TV or PlayStation Vue. Many of these apps can easily be searched using the built-in Voice Search feature. For $8 a month, GeForceNOW allows users to stream games to their Shield at 1080p resolution, but performance is dependent upon internet speed. On the audio side, the Nvidia Shield TV supports 5.1 and 7.1 surround sound, as well as Dolby Atmos object-based surround sound. High-resolution audio is also supported, with some formats supported natively and others supported via passthrough. Why should you buy this? The Apple TV 4K provides a seamless TV experience across all your Apple devices. Who’s it for? Users heavily invested in the Apple ecosystem. After spending two years as an afterthought in the streamer market due to a lack of 4K support, the Apple TV is back and better than ever. With a bevy of cool features, it’s a good choice for Apple devotees and a solid (if spendy) competitor of high-end offerings from Roku, Amazon, and Google. The Apple TV 4K has a few tricks up its sleeve, beginning with its super-fast A10X Fusion processor. Put it this way: The only thing holding this box back speed-wise will be your internet connection. There is also a cool option that allows users to copy login info directly to the Apple TV from iPhones, iPads, and Apple laptops, which drastically reduces the amount of time spent entering passwords. Plus, if you have a third- or fourth-generation Apple TV, it will automatically sync your previous TV OS layout to make life simpler. You can use Siri to search for content, including cross-platform searches, though Apple’s library of apps isn’t as diverse as Roku’s. You can also send images, video, and audio via AirPlay 2 from a supported iOS device. You still have access to heavy hitters like Netflix, Hulu, Sling TV, and more recently, Amazon Prime Video (though the app is half-baked compared to other apps on the device). Plus, you’ll have access to the iTunes store and your entire iTunes library. You can also use intuitive questions and statements for voice-controlled search (“Show me 4K movies on Netflix”) instead of resorting to awkward jargon. As far as picture quality goes, the Apple TV supports 4K and HDR in both Dolby Vision and HDR10. 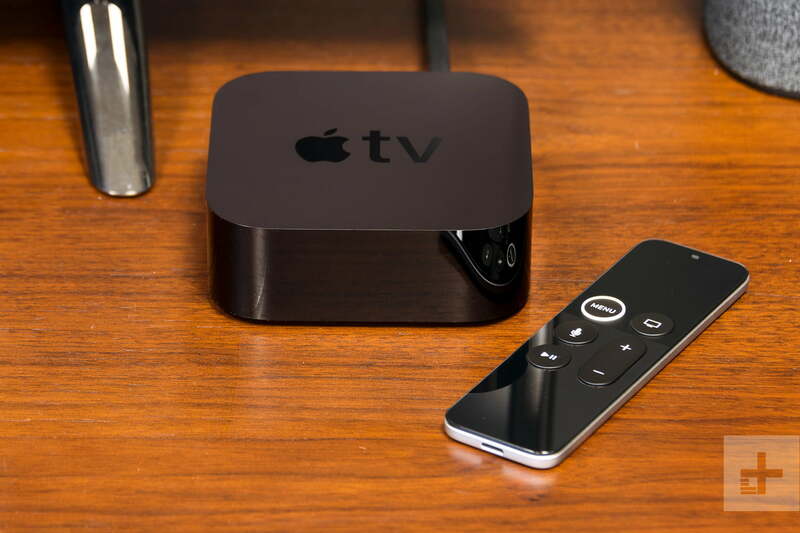 Is the Apple TV 4K worth its hefty price tag? We’re on the fence there, but if you’re one of those “all-Apple-everything” types, this is the streaming device for you. Why should you buy this? The Chromecast syncs with your phone or other media devices for simple streaming. Who’s it for? Anyone who just wants a simple, affordable HD streamer. If you don’t have a 4K HDR-enabled television, you obviously don’t need to spend $50 to $100 on a device that streams in 4K. The Chromecast is a tiny, simple streaming device that works in tandem with devices you’re already using — namely your phone or tablet. Frankly, the 2018 update for Google’s aging HD Chromecast doesn’t add much at all, but the fact that you can’t buy the older model anymore makes this the de facto choice. The new device does have a slightly faster framerate (60 frames per second) for 1080p content and a new look, but other than that it’s pretty much the same old Chromecast, offering the same primary appeal: Dead simple streaming on the cheap. If you do have a 4K HDR-capable TV, and you just love casting, the $70 Chromecast Ultra — which supports both HDR10 and Dolby Vision HDR — will be your best bet. That said, you can get more for your money elsewhere in streaming, including the Roku Streaming Stick+ listed above, as well as the new Roku Premiere+, which costs just $50. Unlike other streaming devices, Chromecasts (including the Chromecast Audio and the Ultra) use the apps you’ve already got on your phone to control playback and search for content. Simply call up your supported streaming app, click the cast button, and you’re ready to watch. Google Home also makes search snappier and more convenient than before. The Chromecast is also deeply integrated into the Google ecosystem — or at least it can be — and supports Google Assistant, as well as any Google smart home devices. For Android and Google die-hards, this is likely going to be a key feature. Users of iOS, Mac, and Windows devices can still get plenty of use out of the Chromecast, though, as each of them supports casting across tons of apps.